We mentioned coming out with a full install ISO for the FreePBX Distro in the [url=http://www.freepbx.org/news/2012-04-18/update-on-2-11-and-full-iso-distro]last blog[/url] so as promised here we are with the details! We’ll discuss that and some core changes that many of you have been asking for. Over a year ago we set out to provide a clean and stable ISO after years of requests from all of you in the community for us to do so. The easiest way to do this at that time was to take the proven and stable build environment that Schmooze uses on the commercial products and modify them for the FreePBX ISO. This process, using a netinstall, worked well. 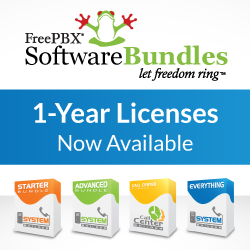 In fact, it worked so well in conjunction with the huge success of the FreePBX Distro to the point of over taxing our systems with many thousands of downloads each month! We have been super excited about this success but at the same time, it has become more and more painful for some of you to get access to the Distro especially outside of the US because the success is putting a big stain on the datacenter bandwidth! I am excited to announce we spent the past few months refactoring everything on how the ISO is built and managed from the ground up and can now offer a Full ISO with 99% of the packages on the Disk in addition to the Net Installer just like we had before. The only difference in the new Net Installer is it includes the kickstart on the disk instead of pulling it from the website to keep things inline with how the Full ISO is built. One of the other neat things we always did before and worked great for Schmooze as all of our hardware was identical and certified, was we would auto detect if you had more than 1 hard drive with no Hardware Raid Controller and we would auto setup software raid. Well this too would cause issues with some people since it would detect things like USB stick as a Hard Drive and try to add them to the raid array. In the new Net Installer we still do this but in the Full ISO you now get 3 options. – Auto-detected raid arrays. This is the same way we have always done the Net Installer and will attempt to detect all the hard drives that you have and setup software raid. Lastly there are a few items that the Full ISO has to do after install in the firstboot area. This is installing RPMs that can not be installed at the Installer time and updating all your modules in FreePBX to the latest version of the same release such as 2.10. When this firstboot runs it detects if you have internet and if not it will exit and inform you that you need to get internet configured on the box and then a command to type to have it finish running through the firstboot installer stuff. This should solve the issue where network drivers are not supported in the default install but allow you to get 99% of everything installed resolve your network drivers and then run the firstboot scripts to finish it. And for all the users who would would rather not be bothered or consumed with installing the software and making sure the hardware works well you can always visit the [url=http://www.schmoozecom.com/freepbx-appliance.php]FreePBX Store[/url] and purchase a certified Hardware Appliance with the latest version of the Distro pre-installed for you.